Atlantis Side White Outdoor flexible LED lines are specially designed for professional decorative outdoor lighting applications. Atlantis LED lines are a perfect suit for lighting along uneven surfaces, such as coves, pillars, rounded edges and many more. Atlantis LED lines are rated at IP67 for ingress protection. They are completely protected against solid particles (dust) and can submerged underwater down to 1 m (3.3 ft) of depth. 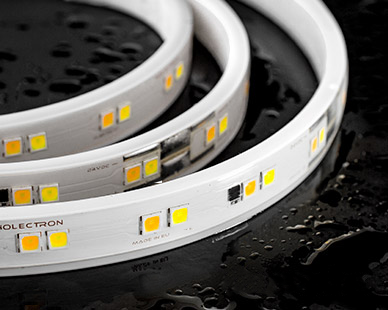 Atlantis LED lines are fully UV resistant, as well as salt and solvent proof. 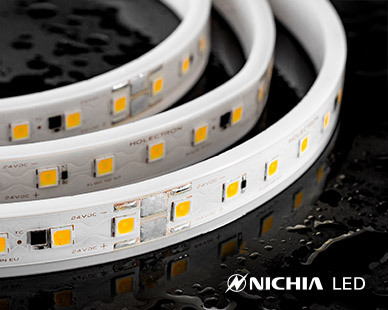 For these waterproof IP67 flexible LED strips we use the highest quality materials, NICHIA LEDs from Japan, current stabilization system inside. LED strips used inside Atalantis are available with 3 Step MacAdam. Continuous line, no dark sports in connection points.